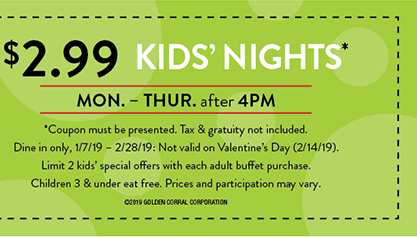 Get a kids meal for $2.99 with this Golden Corral coupon good on Mondays – Thursdays through February 28, 2019. CLICK HERE for your Golden Corral coupon. Good for a kids meal for $2.99 after 4 pm Mondays through Thursdays. Limit 2 kids meal redemptions per adult buffet purchase. Not valid on Valentine’s Day. Note: Kids 3 and under are always free at Golden Corral. *Good at participating locations. Golden Corral announced the promotion in This Email. Golden Corral is currently featuring Signature Sirloin and Wingfest on their dinner buffet. Where can you get unlimited wings AND sirloin grilled just how you like, for one price? Only at Golden Corral. Golden Corral is an American family-style restaurant chain serving breakfast, lunch and dinner, featuring a large all-you-can-eat buffet and grill offering numerous hot and cold dishes, a carving station and their Brass Bell Bakery. It is a privately held company headquartered in Raleigh, NC, with locations in forty-one states. The company has about 500 locations.